Combine water, 1/4 cup sugar, and yeast in a small bowl; stir until combined. Let set for 5 to 10 minutes, or until it swells or bubbles. Add eggs to a large mixing bowl, whisk eggs slightly. Add milk, remaining sugar, salt, and yeast mixture and mix using an electric mixer. Add 3 cups of flour and beat until smooth. Add shortening and continue to mix. Add remaining flour and mix until a soft dough is formed. Turn dough onto lightly floured surface, knead dough until smooth, about 10 minutes (a mixer dough hook can expedite this process). Place dough into a large bowl, cover with a linen towel, and set in a warm place to rise until doubled, about 2 hours. When ready to fry, preheat oil in Presto® electric deep fryer. If using an adjustable thermostat deep fryer, set at 350°. Do not use a frying basket with this recipe. Divide dough into thirds for easier handling. On lightly floured surface, roll dough out 1/4-inch thick and cut into 2-inch squares or triangles. Fry until golden brown, turning continuously. Remove and drain on paper towels. Sprinkle with powdered sugar. Serve hot with extra powdered sugar. 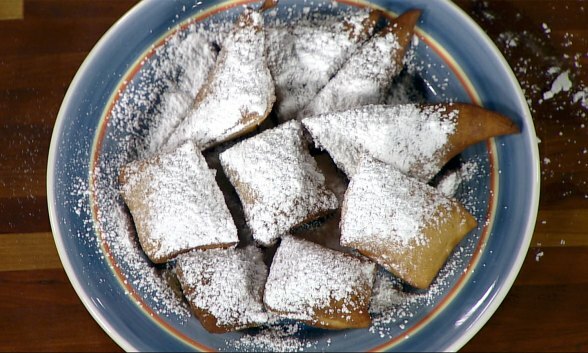 Watch Chef Kevin Belton prepare French Quarter Beignets in this video. You can make this dough ahead of time, let it rise, and then refrigerate. It holds for two or three days wrapped in plastic wrap. You can freeze it too. Quarter the dough and wrap each section. Just remove, thaw, and fry.